61 A.D. Each player is a character on the run with their lover, accused of crimes against the empire. The fugitives find themselves in Bertinoro, on the hills of Romanina. But, in that torrid summer, Bacchus and his followers came into the vineyards surrounding the town to play with mortal’s destiny. 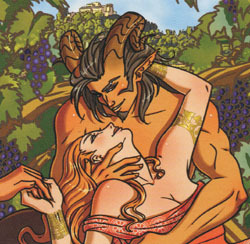 Bacchanal includes the rules and the deck of 80 full-color custom cards used in the game.